Last week’s budget left many Ontarians confused. The Minister of Finance had warned that dealing with the provincial deficit would require spending cuts and “sacrifice” from all of us, yet the budget actually increased investment in both dental health for low-income seniors and child care for families (analysis of the child care credit can be read here). Plus, it talked about hundreds of millions of dollars in increased spending. Meanwhile, the budget deficit was going down, but slowly, and wasn’t forecast to go into surplus until after the next provincial election. So was this a Goldilocks budget? Not too hot and not too cold? This isn’t a Goldilocks budget. It’s an austerity budget with a bow wrapped around it. Where is the budget on spending? 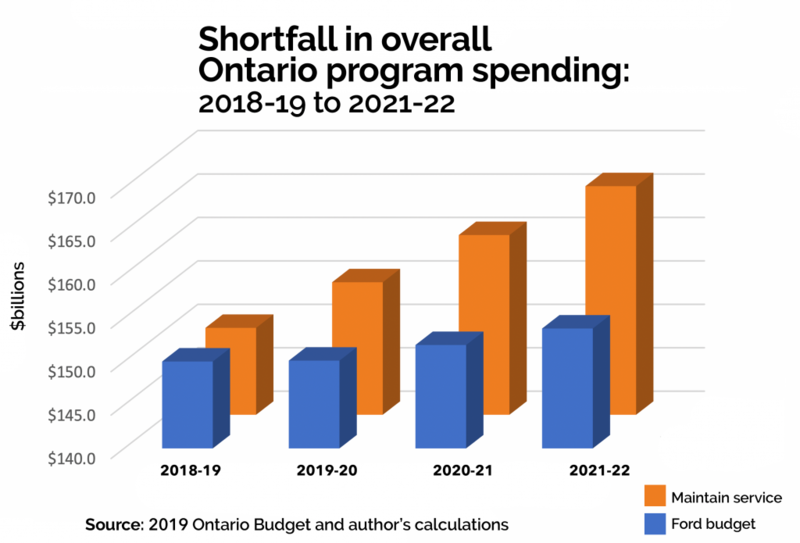 To maintain the same level of services as when they took office, the Ford government would have to increase program spending by 3.5% per year, every year. Instead, the 2019 budgets increases program spending by an average of 0.8% per year over the next 3 years. The chart below shows how this shortfall in spending will snowball over the next three years. It starts out at just over $5 billion in 2019-20; it will rise to $12.5 billion in 2021-22. These are overall figures for all program spending. The budget is entitled, Protecting What Matters Most, which presumably includes health care and education, the two areas the province spends the most on. Yet health care and education also face major—and growing—funding gaps. 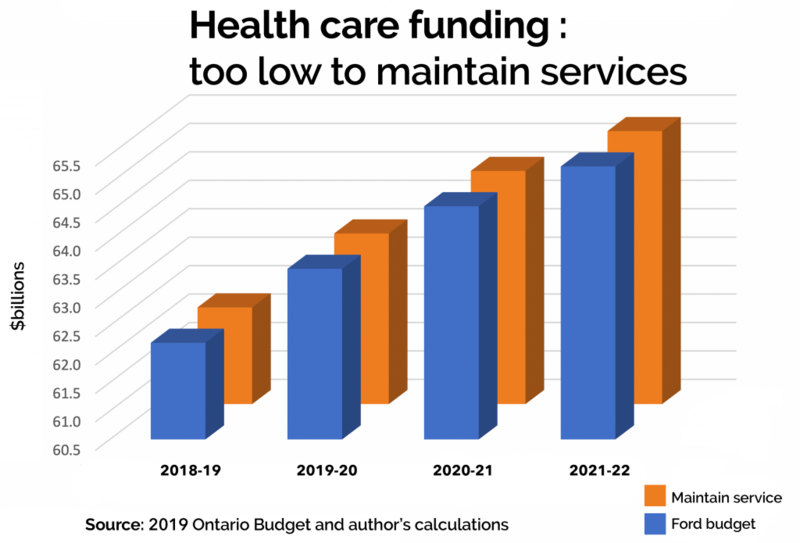 The chart below shows the budgeted spending increases for health care as compared to what would be needed to keep health services at their 2018-19 levels. While health care spending has to increase by 4% per year to maintain services, it is increasing by only 1.6% per year. The funding gap grows from $1.2 billion this year to $4.7 billion in 2021-22. Taking a look at education funding, we see a similar story. 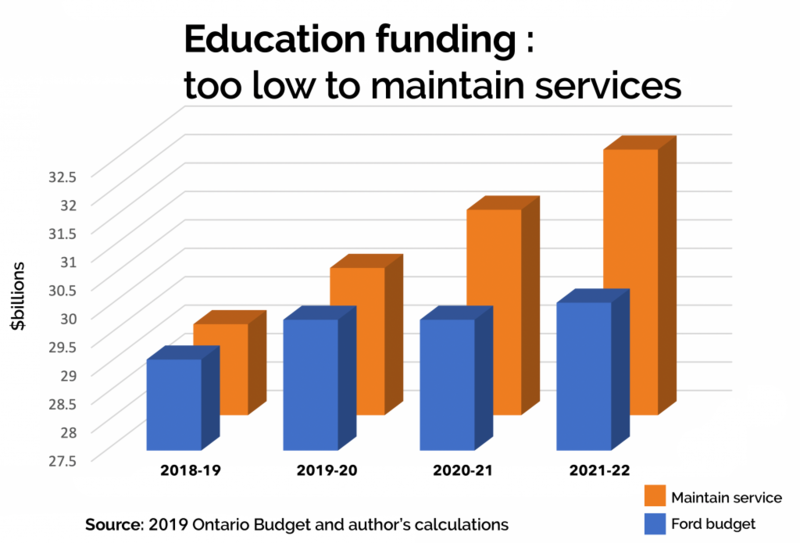 To maintain services, education spending has to increase by 3.4% per year; in this budget it increases by an average of 1.1%. The shortfall of $300 million this year grows to over $2 billion in 2021-22. While services are being strangled, the deficit numbers don’t seem to budge much. That is because tax cuts are draining the provincial coffers. Some of them were announced in the fall, and more were announced in this budget. Those tax cuts average $3.6 billion a year over the next three years, and they will prove very expensive to Ontarians as they struggle with the reductions in public services that are sure to come. Sheila Block is a senior economist with the Canadian Centre for Policy Alternatives’ Ontario office. You can find her on twitter at @Sheila_M_Block.